This is the highest-resolution color departure shot of Pluto's receding crescent from NASA's New Horizons spacecraft, taken on July 14, 2015, when the spacecraft was 120,000 miles (200,000 kilometers) away from Pluto. Shown in approximate true color, the picture was constructed from a mosaic of six black-and-white images from the Long Range Reconnaissance Imager, with color added from a lower resolution Ralph/Multispectral Visible Imaging Camera color image. 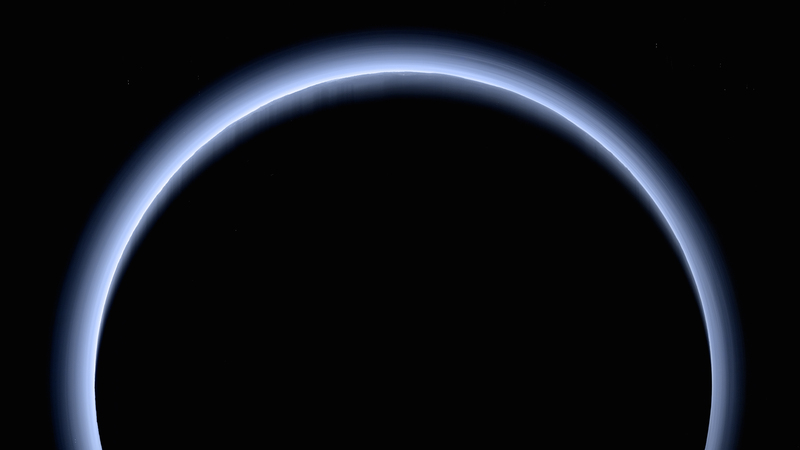 The image is dominated by spectacular layers of blue haze in Pluto's atmosphere – which the Alice instrument probed to gather compositional data.